The Logan County Area Chamber of Commerce would like to recognize Wishwell Farms Produce as August's Chamber Business/Entrepreneur of the Month. Wishwell Farms Produce has been open for 12 years and raises 75 acres of fruit and vegetables including; sweet corn, tomatoes, green beans, cantaloupe, watermelon, strawberries, peas, peppers, cucumbers, pickles, squash, broccoli, cabbage, cauliflower, brussels' sprouts, eggplant, lettuce, spinach, pumpkins and gourds, with many other items such as peaches, potatoes, onions, raspberries, blackberries, blueberries, and apples brought in from other growers. Jason Wish grew up on Wishwell Farms, a grain and dairy operation that started four generations ago. Jason graduated from The Ohio State University in 1998 with a degree in animal and dairy science, and was poised to one day operate the family dairy farm. 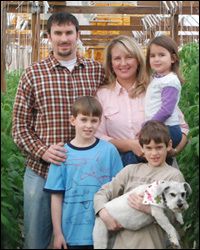 The farm is currently operated by Jim and Susan Wish. While working on the dairy farm, Jason started selling produce part time. During this time his interest in produce production continued to grow and so did the stand he and his wife Kristin maintained out of their garage. Wishwell Farms Produce is one of the fastest growing produce farms in the area. The operation not only includes the produce farm but also four greenhouses with over 10,000 square feet. Two of the greenhouses are used for growing hydroponic tomatoes 10 months out of the year. Another is used for starting seeds and growing plants, and the last is used for sale of garden plants. Wishwell produce is marketed through the family's farm market located at 3381 N U.S. Route 68. They also have a second retail location in Marysville. The produce is also available at 14 farmers' markets in 5 counties and multiple restaurants in the greater Columbus area. For more information visit their web site at www.wishwellfarms.com or their Facebook page,www.facebook.com/WishwellFarms. Please join us in thanking Wishwell Farms Produce for their continued support of Logan County!! Thank you for helping us make Logan County a great place to live, work and play!